I’ve been lucky enough to tour a couple of car factories since I started writing this blog. In Oxford I visited the Mini final assembly line, witnessing how painted bodyshells creep through the factory as glass, engines, wheels and interiors are bolted, screwed, hammered and glued into place. To cope with Mini’s famously wide variety of optional combinations, parts arrive on site in carefully pre-arranged order – a truck delivering seats, for example, will disgorge the various colours and trims in the same order as they’ll be needed on the line. More recently, in Sweden, I saw giant rolls of galvanised steel going in one end of the sprawling factory, and shiny new Volvos driving off the line at the other. In between, the busy robots and skilful people brought 12,000 components together into one functioning, reliable whole. It really has to be seen to be appreciated. As a result I have a lot of sympathy for small firms trying to compete in this unforgiving arena of complexity. 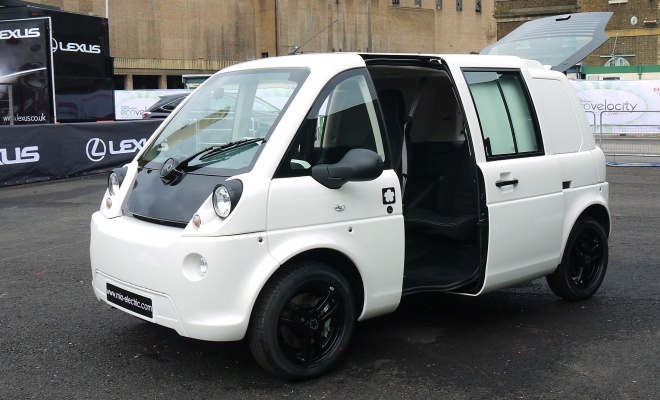 Which is why I’m impressed rather than disappointed with my first, brief drive of the Mia electric microbus. Even if a battery-electric drivetrain does dramatically simplify matters, it’s still a huge task to design, develop and assemble a fully functioning car. Yes, the interior has all the tactile quality of a mop and bucket, and the plastic-clad steel frame chassis flexes and shudders over bumps as if disintegration might be imminent, but it drives and steers and stops and nothing actually falls off. I’ve blogged about the Mia before. It was initially developed by coachbuilder Heuliez, best known for building folding roofs for coupé-convertibles. The project is now in the hands of a newly formed French company, Mia Electric, established for the purpose. The Mia has been subtly remodelled since it first debuted as the Heuliez Friendly. But its basic form is unchanged: a loaf-shaped hatchback with twin sliding passenger doors, electric drive, and an arrowhead seating plan. The doors slide open, following a firm prod of an unusual, flower-shaped push-button. They’re not powered, but slide easily on their runners, taking a section of roof and floor with them. 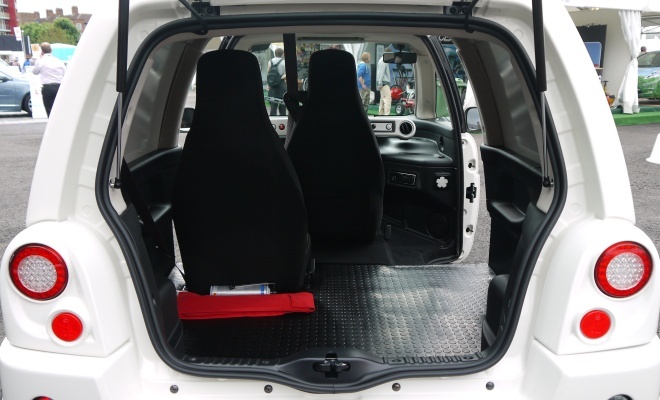 The two cutouts ease access to the central driver’s seat, but entry is still a little awkward due to a pair of carpeted chassis rails that stand proud of the floor. Once in place, the first thing that strikes is that the footwell is surprisingly cramped. There are only two pedals and it’s just as well there isn’t a third as it wouldn’t fit. I had assumed that the central driving position would lead to a pedal box fit for a pair of clown’s boots, but the reality is quite the opposite. The rear-view mirror has migrated to the top right corner of the windscreen, so as not to reflect a view of your own forehead. It would be more natural for UK drivers to glance top left, but perhaps that will have changed when UK deliveries start next year. That and the dip direction of the headlights is all that needs to change to switch the car between left and right hand drive markets. Three editions of the car will go on sale, a three-seater that’s 2.9m long and weighs 815kg, a 3.2m long-wheelbase four-seater that adds another 21kg to the kerb weight, and an 815kg, long-wheelbase van. A Smart ForTwo, for comparison, is 2.7m long. All three Mia versions have a top speed of 100km/h (62mph). Range is quoted as 130km (80 miles) from the 12kWh lithium iron phosphate battery that will be fitted to UK cars. A full recharge takes five hours. 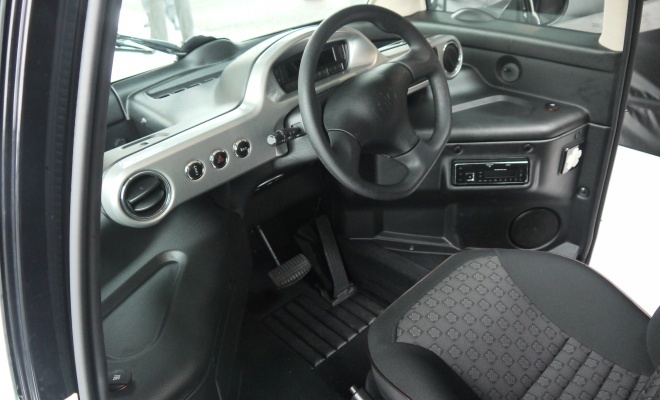 Inside, the plastic steering wheel is large and incongruously flat-bottomed, but does boast an airbag. 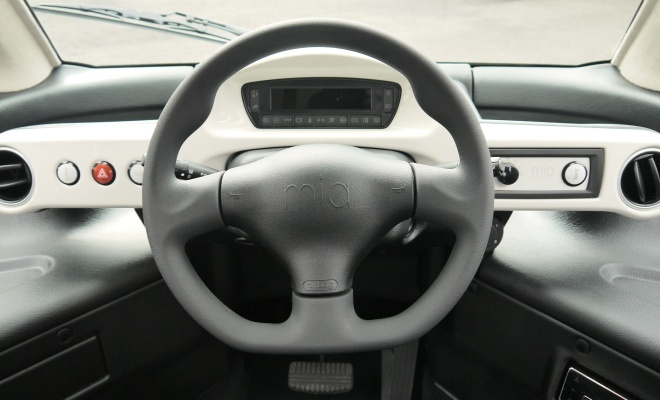 The Mia is homologated as a proper car, so has had to pass crash tests before going on sale. There’s no power assistance, but low gearing, narrow tyres and the Mia’s modest bulk mean the steering feels reasonably light. The instrument panel is a backlit digital strip giving basic information, including the all important battery reserve. There’s no range prediction, but I’m told one will be included before UK deliveries start. The instrument display sits in the centre of a wide floating dashboard holding the various control buttons. At the extreme right is the gear selector, a smooth round pushbutton that simply toggles between forward and reverse. Oddly, there’s no way to select neutral other than by halting and sliding open a door, whereupon the transmission is automatically taken out of gear. There’s a conventional handbrake nestling next to the driver’s seat, a throttle-softening eco-mode button, and that’s about it for the major controls. On the move, the Mia feels unfamiliar mainly due to the central seating position. You quickly adjust to positioning the car on the road – it helps that the Mia is narrow to begin with – but it still feels odd chatting to passengers seated entirely out of sight behind you (unless you earn your living as a chauffeur or cab driver, I suppose). Refinement, as discussed, is not exactly the watchword. There’s plenty of chassis and body noise as well as shimmies and shakes, and there’s a surprising amount of body roll around corners, despite the low positioning of the 150kg batteries. Acceleration from the 13bhp motor feels leisurely, doubly so in eco mode, but is perfectly adequate for urban roads. 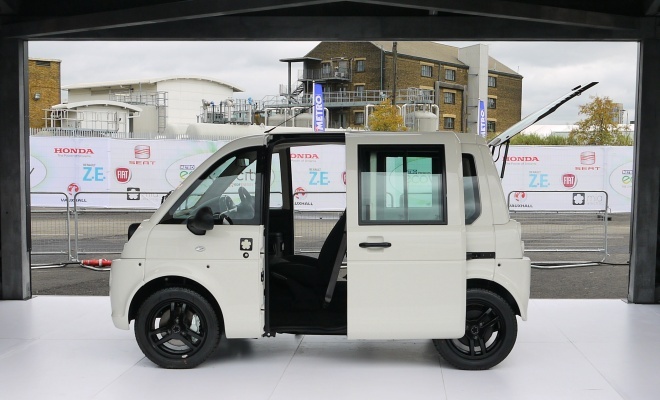 I tested the car on a short closed loop at the recent EcoVelocity show rather than on real roads, so wasn’t able to assess what happens much above 30mph. Halting from these modest speeds reveals brakes that feel reassuring normal, assisted by a conventional vacuum cylinder that’s primed by a small electric pump. I imagine the Mia would be fun to drive on proper roads, but it certainly wouldn’t be fun to buy in the first place. Prices will start at £22,012 after a £5,000 contribution from the government’s plug-in car grant, which most buyers will find hard to square (and not only because it’s about £2,000 more than the equivalent model’s price in France). As I said at the start, I unreservedly admire the talent and commitment required to get a new car to this stage. But building a product and persuading people to buy it are very different challenges. The Mia’s chassis might not be the most rigid I’ve ever driven but at the current price, given the alternatives, the business plan looks shakier still.